With “incantatory prose” that “sweeps over the reader like a dream,” (Philadelphia Inquirer), Hoffman follows her celebrated bestseller The Probable Future, with an evocative work that traces the lives of the various occupants of an old Massachusetts house over a span of two hundred years. In a rare and gorgeous departure, beloved novelist Alice Hoffman weaves a web of tales, all set in Blackbird House. 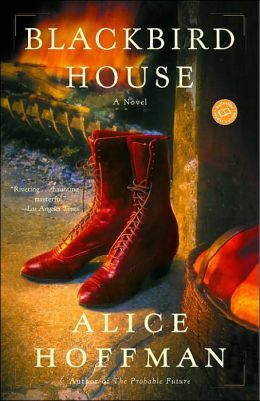 This small farm on the outer reaches of Cape Cod is a place that is as bewitching and alive as the characters we meet: Violet, a brilliant girl who is in love with books and with a man destined to betray her; Lysander Wynn, attacked by a halibut as big as a horse, certain that his life is ruined until a boarder wearing red boots arrives to change everything; Maya Cooper, who does not understand the true meaning of the love between her mother and father until it is nearly too late. From the time of the British occupation of Massachusetts to our own modern world, family after family’s lives are inexorably changed, not only by the people they love but by the lives they lead inside Blackbird House. Picked this one up by chance and it wasn’t bad.